Just a card to wish a very happy and wonderful birthday to my fellow DT Monika at ATSM, head over to STAMPlorations blog to wish Monika a happy birthday. Currently I am away on my holiday, so sharing a card which I made earlier. 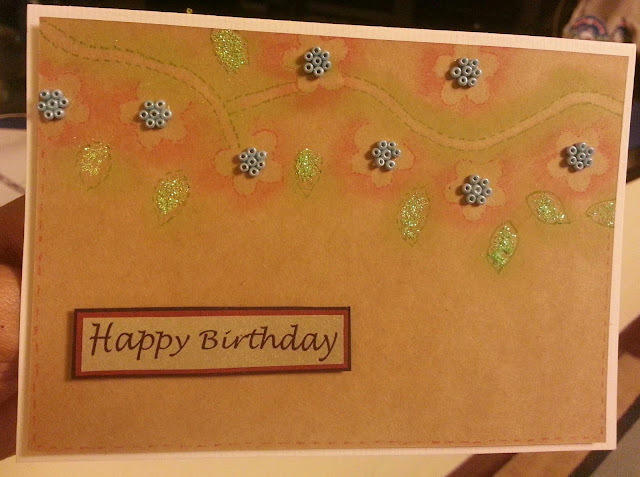 For this card, I chose a kraft color card stock, sponged some flowers and leaves. I added some green glitter on the leaves, and also some beads for the center of the flowers. Finally a simple sentiment of wind off the card. A very simple looking card. Once again a very happy birthday to Monika, I wish you a funtabulous day and a happy and healthy year ahead! Sorry for a bad picture :( can't correct it right away, once I am back in Macau will update a new picture.